We were recently fortunate enough to be given the opportunity to review the Graco Milestone All-In-One Car Seat. The timing was perfect as Tyne's old car seat was looking a little worse for wear after one too many drive time "treats" had been allowed, and no amount of washing the covers was making it look any better. When the Graco Milestone arrived, Tyne was delighted to try it out and declared it his "big boy" car seat immediately. I'm sure that I don't need to express how important car seat choices are, for the health and safety of your child and keeping up with current UK guidelines is vital..in addition to this you of course also want your child to be as comfortable in their car seat as they can possibly be whilst remaining as safe as possible - and this is where the Graco Milestone has excelled for us - Tyne declares it his "comfy" chair, and has never complained about chaffing or uncomfortable straps once since using it. Billed as the only car seat your child will ever need as it transitions from baby seat until they no longer need a car seat (which is now recommended as being up to 12 years old by Health and Safety guidelines) the Milestone seemed almost to good to be true when I first saw the ad for it. Graco state that from birth it's to be used in the rear facing position and then moved to forward facing as your child grows-using ...but using just one seat? Can one car seat really be the only one you ever need to buy?! Well, yes it can! And trust Graco to come up with it! For anyone not familiar with them, Graco are one of the largest, most trusted and best known manufacturers of childrens products in the world. The company was initially formulated in 1942 by Robert Cone and Russell Gray to manufacture car parts and spares in Philadelphia, PA.
An engineer who worked for the company by the name of David Saint hit upon an idea after an associate informed him how he would soothe his children by using a backyard swing. Saint, a father of 9 (yes 9!!!) drew upon this and eventually came up with the world's first wind up child swing, the Swingomatic. Whilst sales predictions were fair to good, no one anticipated just how many units would sell. The Swingomatic became a worldwide sensation and Graco established itself as a leader in the child and juvenile market. Since those early days Graco has grown to become a name recognised the world over and makes a variety of child products from car seats to pushchairs, swings, highchairs and baby alarms. A company does not become this huge in such a market without being in touch with the consumer and caring about the end user, in this instant your child. This may seem like a cliche, but the Milestone really does reinforce this last statement - Graco understand that parents need top quality products to ensure their childrens comfort and safety at affordable prices - and it really doesn't get much more reasonable than the Milestone. The Milestone we were sent was listed as the Aluminium coloured model-This is a a very dark grey/black with beige padded shoulder strap pads and headrest - very stylish! When we first examined the Milestone, after the unboxing, both Jon and I were very impressed with how comfortable it looked whilst maintaining the air of robustness and quality. It was clear how much thought and effort has gone in to this seat. 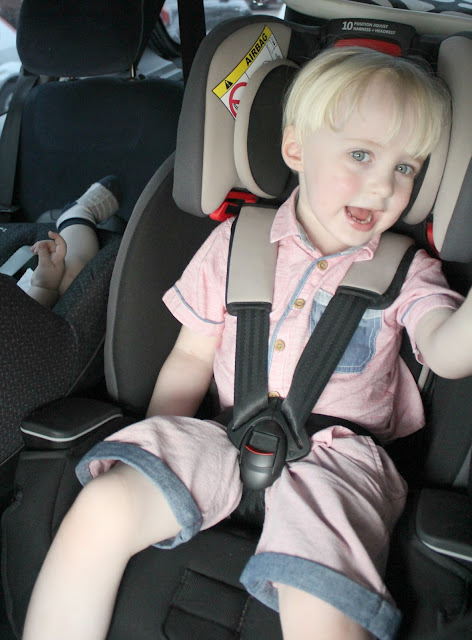 The quality stitching and fabric, the ample padding and even the feature of a cup holder all testify to just how much planning and care has gone in to the design and manufacture of this great car seat. Now if you're like us, you'll know that fitting a car seat can be an awkward, and sometimes painful experience. Scratched hands, nipped fingers and bent nails all seem to conspire when attempting to put a potentially life saving piece of kit in to the back of your car. 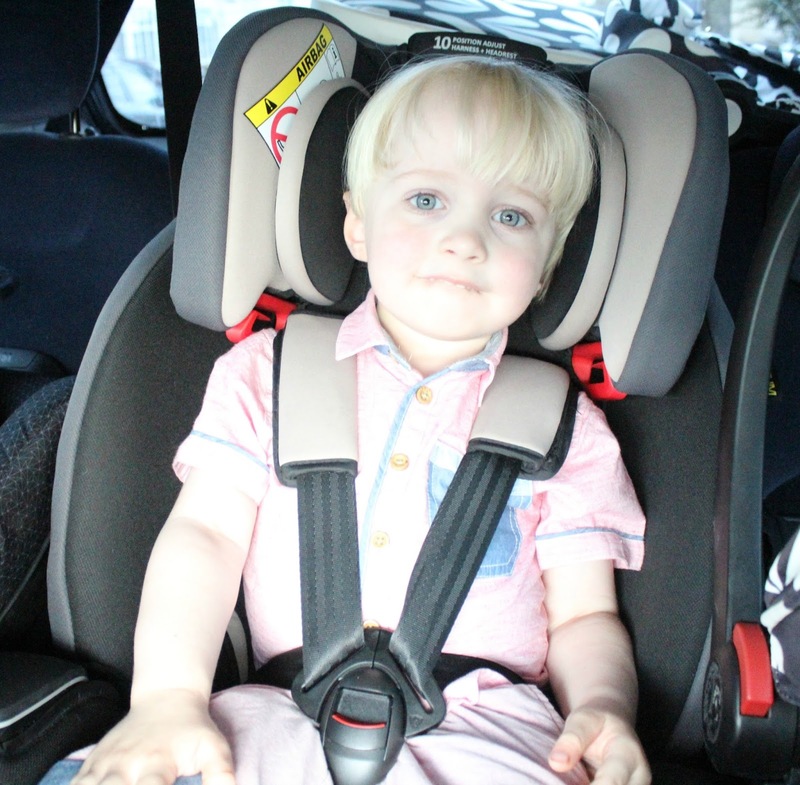 Whilst some companies such as Halfords do offer a free child seat fitting service, it's not always practical or possible to take advantage of this offer. Once in place,the seat does not wobble or give and is an extremely stable fit in our car. The fitting of the seat was very quick and by following the very simple instructions, the seat was ready for Tyne to test out within minutes. The straps were easy to adjust, and switching between the different positions for different age groups could not be simpler. Since the initial installation, we have adjusted the straps once for Tyne after a bit of a growth spurt. This is done by merely pressing on a red lever on the headrest, we can adjust the headrest height and harness with it, for a more comfortable ride for Tyne. It's so easy, and unlike some seats we've had in the past, the Milestone can remain insitu whilst doing this. making life just that little bit easier and less stressful for the adult. 4) A 4 position recline to make any child more comfortable. Two positions in rear facing and two in forward facing. 5) Built in storage compartment for the harness when no longer required. There are many more features, but almost to many to list here - One of Tyne's favourites however is the cup holder. He no longer has to keep asking Mummy or Daddy for a drink while we're travelling but can now remove and replace his cup at will-such independance. Overall, the seat is a very high quality product that lives up to the claims of Graco, it really will grow with your child and we wish we'd had one from day one with Tyne. I know we'll be seriously considering one for Noah and Sailor as well. This is a great seat and one that we love, most importantly however it's very safe. Tyne loves his 'Big Boy Seat' and that's the real winner for Mummy and Daddy! The Graco All-In-One Car Seat is available through many outlets including Mothercare where it is priced at the bargain price of £179.99 -when you take into account how long this car seat will last you and compare its price to some of it's competitors, it really cannot be sniffed at!